木星 – perijove pass as viewed by JunoCam. 木星 - 南方風暴 - JunoCam. ^ 2.0 2.1 Chang, Kenneth. NASA's Juno Spacecraft Enters Jupiter's Orbit. The New York Times. July 5, 2016 [July 5, 2016]. ^ Greicius, Tony. Juno – Mission Overview. NASA. September 21, 2015 [October 2, 2015]. ^ 4.0 4.1 4.2 4.3 4.4 Juno Spacecraft Information – Power Distribution. Spaceflight 101. 2011 [August 6, 2011]. ^ Dunn, Marcia. NASA probe blasts off for Jupiter after launch-pad snags. MSN. August 5, 2011 [August 31, 2011]. ^ Chang, Kenneth. NASA's Juno Spacecraft Will Soon Be in Jupiter's Grip. The New York Times. June 28, 2016 [June 30, 2016]. ^ NASA – Juno's Solar Cells Ready to Light Up Jupiter Mission. www.nasa.gov. [October 4, 2015]. ^ NASA's Juno Spacecraft Launches to Jupiter. NASA. August 5, 2011 [August 5, 2011]. ^ Mission Acronyms & Definitions (PDF). NASA. [April 30, 2016]. ^ Dunn, Marcia. NASA going green with solar-powered Jupiter probe. USA Today. August 1, 2011. ^ NASA's Shuttle and Rocket Launch Schedule. NASA. [February 17, 2011]. ^ Chang, Alicia. Juno: Jupiter-bound NASA spacecraft runs into problem after Earth flyby. Toronto: The Star. October 9, 2013 [10 October 2013]. ^ Greicius, Tony. NASA Re-plans Juno’s Jupiter Mission. NASA. 2018-06-06 [2018-06-11] （英语）. ^ 16.0 16.1 Greicius, Tony. Juno - Mission Overview. NASA.gov. May 7, 2015 [June 20, 2015]. ^ Atlas/Juno launch timeline. July 28, 2011 [August 8, 2011]. ^ NASA's Juno is Halfway to Jupiter. NASA. 12 August 2013 [12 August 2013]. ^ 24.0 24.1 Moomaw, Bruce. Juno Gets A Little Bigger With One More Payload For Jovian Delivery. SpaceDaily. March 11, 2007 [August 31, 2011]. ^ Setting up Juno's Radiation Vault. NASA. July 12, 2010 [April 5, 2011]. ^ Cureton, Emily Jo. Scientist with area ties to study Jupiter up close and personal. Big Bend Now. June 9, 2011 [July 17, 2011]. （原始内容存档于2011-11-25）. ^ Juno Science Objectives. University of Wisconsin-Madison. [October 13, 2008]. （原始内容存档于2008年10月16日）. ^ Iorio, L. Juno, the angular momentum of Jupiter and the Lense–Thirring effect. New Astronomy. August 2010, 15 (6): 554–560. Bibcode:2010NewA...15..554I. arXiv:0812.1485. doi:10.1016/j.newast.2010.01.004. ^ Helled, R.; Anderson, J.D. ; Schubert, G.; Stevenson, D.J. Jupiter's moment of inertia: A possible determination by Juno. Icarus. December 2011, 216 (2): 440–448. Bibcode:2011Icar..216..440H. arXiv:1109.1627. doi:10.1016/j.icarus.2011.09.016. 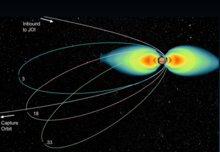 ^ Iorio, L. A possible new test of general relativity with Juno. Classical and Quantum Gravity. doi:10.1088/0264-9381/30/19/195011. ^ Instrument Overview. Wisconsin University-Madison. [October 13, 2008]. （原始内容存档于2008年10月16日）. ^ Key and Driving Requirements for the Juno Payload Suite of Instruments (PDF). JPL. [February 23, 2011]. （原始内容 (PDF)存档于2011年7月21日）. ^ Juno Spacecraft: Instruments. Southwest Research Institute. [December 20, 2011]. （原始内容存档于2012年4月26日）. ^ Juno Launch: Press Kit August 2011 (PDF). NASA: 16–20. [December 20, 2011]. ^ MORE AND JUNO KA-BAND TRANSPONDER DESIGN, PERFORMANCE, QUALIFICATION AND IN-FLIGHT VALIDATION (PDF). Laboratorio di Radio Scienza del Dipartimento di Ingegneria Meccanica e Aerospaziale, università "Sapienza". 2013. ^ Alan Boyle. Fresh raw imagery from NASA’s Juno orbiter puts Jupiter’s fans in 11th heaven. 2018-02-09. ^ David Dickinson. US to restart plutonium production for deep space exploration. Universe Today. March 21, 2013 [February 15, 2015]. ^ Greenfieldboyce, Nell. Plutonium Shortage Could Stall Space Exploration. NPR. [December 10, 2013]. ^ Greenfieldboyce, Nell. The Plutonium Problem: Who Pays For Space Fuel?. NPR. [December 10, 2013]. ^ Wall, Mike. Plutonium Production May Avert Spacecraft Fuel Shortage. [December 10, 2013]. ^ Juno's Solar Cells Ready to Light Up Jupiter Mission. [June 19, 2014]. ^ Juno prepares for mission to Jupiter. Machine Design. [November 2, 2010]. （原始内容存档于2010年10月31日）. ^ Amos, Jonathan. Juno Jupiter probe gets British boost. BBC News. 4 September 2012 [2012-09-04]. ^ 46.0 46.1 Juno Jupiter Mission to Carry Plaque Dedicated to Galileo. NASA. August 3, 2011 [August 5, 2011]. ^ Juno Spacecraft to Carry Three Figurines to Jupiter Orbit. NASA. August 3, 2011 [August 5, 2011]. ^ Peter Pachal. Jupiter Probe Successfully Launches With Lego On Board. PC Magazine. August 5, 2011. ^ Juno's Two Deep Space Maneuvers are 'Back-To-Back Home Runs'. NASA News. September 17, 2012 [October 12, 2015]. 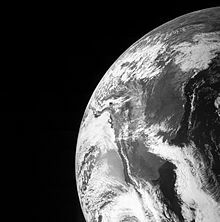 ^ Juno Earth Flyby - Oct. 9, 2013. NASA. [July 4, 2016]. ^ Agle, D. C.; Brown, Dwayne; Cantillo, Laurie. NASA's Juno Successfully Completes Jupiter Flyby. NASA. August 27, 2016 [October 1, 2016]. ^ Mission Prepares for Next Jupiter Pass. Mission Juno. Southwest Research Institute. October 14, 2016 [October 15, 2016]. ^ Agle, D. C.; Brown, Dwayne; Cantillo, Laurie. NASA Juno Mission Completes Latest Jupiter Flyby. NASA / Jet Propulsion Laboratory. December 12, 2016 [December 12, 2016]. ^ 54.0 54.1 Thompson, Amy. NASA's Juno Spacecraft Preps for Third Science Orbit. Inverse. December 10, 2016 [December 12, 2016]. ^ It's Never 'Groundhog Day' at Jupiter. NASA / Jet Propulsion Laboratory. February 1, 2017 [February 4, 2017]. ^ Alexandra Witze. Jupiter’s secrets revealed by NASA probe. nature. 2017-05-25. ^ Juno update: 53.5-day orbits for the foreseeable future, more Marble Movie. www.planetary.org. [2018-06-11] （英语）.